The boudin king cake craze hit the Mardi Gras scene in 2014. It is the savory “sibling” to the season’s sweet treat of cream cheese and fruit-filled king cakes. With Lake Charles being the home to the Southwest Louisiana Boudin Trail, it is only right for us to share a recipe! 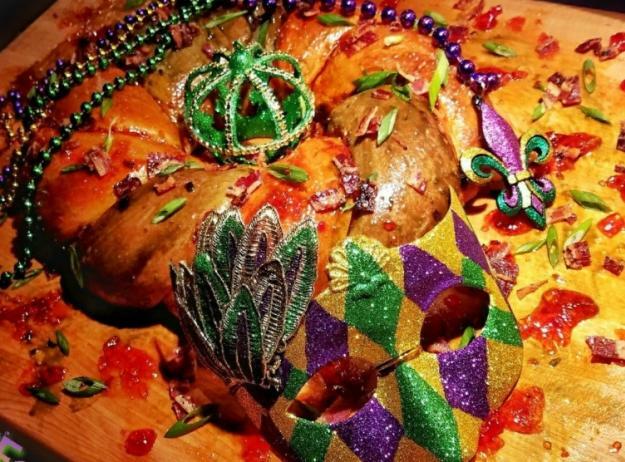 Chef Derrill Guidry has put together a mouthwatering and BEAUTIFUL boudin king cake. The key to the best taste is to use local boudin, fresh herbs in the dough, and of course…bacon on top! Make this recipe your own by changing up the toppings. Popular toppings are Steen’s cane syrup, fried cracklings, and pecans. You could even add some spicy cheese to the stuffing. Or, you can keep it simple. Boudin doesn’t need much dressing up. DOUGH — In a small saucepan, heat milk to about 110°F, remove from heat, and whisk in the sugar until dissolved. Add the yeast and allow it to bloom 10-15 minutes. (You can also use rapid-rise yeast). Once the yeast has bloomed, whisk in the melted butter, eggs and yolks. In a stand mixer bowl add the salt, cinnamon, nutmeg, basil, and 5 cups of the flour. Add the liquid mixture to the dry ingredients, attach a dough hook to the mixer, and turn the machine on low until all ingredients are combined. Increase the speed and knead dough for 5-7 minutes, gradually adding the remaining flour until the dough is firm but sticky to the touch. Once kneaded, cover the bowl with a cloth and place in a warm area to rise and double in size, about 1 hour. BACON — Next prepare the bacon. Preheat the oven to 325°F. Place bacon slices in a bowl, season with pepper, and toss with the brown sugar. Arrange the bacon in a single layer on a baking sheet lined with parchment paper. Add another layer of parchment over the bacon, then place the second baking sheet squarely on top of the bacon to flatten it as it cooks. Place the tray in the center of the oven and bake for 20 minutes. Check the bacon by lifting the top tray and parchment. Continue to bake until golden brown and crispy, checking often to ensure it does not burn. Remove from oven and allow to cool completely, chop coarsely and set aside. BOUDIN — Place the uncased boudin filling into a microwave-safe bowl, and warm on high for 30 seconds at a time to make the mixture more pliable (cold boudin can be crumbly and hard to work with). You want to just make it soft, but not fully heat it. Preheat oven to 375°F. Once the dough rises, punch it to knock out the air, then turn it out onto a large floured surface. Divide the dough into two equal pieces. Take one piece and roll it to form a long sausage, then roll with a rolling pin to flatten into a rectangular shape. Take half the boudin mix and arrange it along the middle of the dough piece forming a large log. Fold the dough over the sausage, then continue rolling to seal it. Brush seam with melted butter and gently press to seal. You should have a long snake-shaped piece of dough stuffed with boudin. Repeat this process with the second piece of dough and remaining boudin. Bring both pieces side by side, pressing two of the ends together to join them. Then carefully braid the dough pieces, overlapping them with each other. Pull the ends together to form a circle, and seal the end pieces together. Brush dough with any remaining butter. Gently place the braided loaf on a large tray lined with parchment paper, and cover with a cloth, allowing it to rise another 30 minutes. Place stuffed cake into the oven and bake until golden brown, about 30-40 minutes. Remove from oven and allow to cool. Heat the red and green jellies in separate saucepans over low heat, whisking until melted. Generously brush king cake with the jellies, sprinkle with candied bacon and green onion, cut and serve. 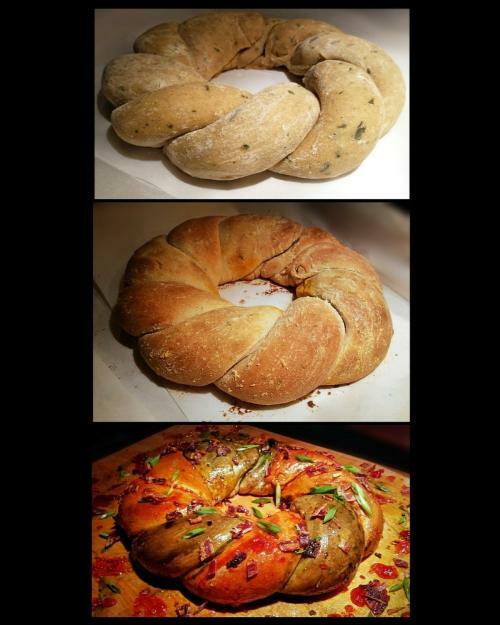 If you’d prefer the traditional sweet king cake, click here for the recipe. You can purchase boudin king cakes at Delicious Donuts, Happy Donuts, Brown&apos;s Food Center and Cajun Cakes N&apos; Creations. Even Tia Juanita&apos;s Fish Camp has one! And make sure you share your culinary creations with us. Tag your photos with #eatswla and #VisitLakeCharles.